We are one of the only irrigation companies in the Western Kentucky and Northwest Tennessee area using the trenchless irrigation method. This installation technique helps ensure your project is completed quickly, without disrupting the beauty of your lawn. We use specialized equipment to carefully slice through lawn turf and lay the necessary pipe and wiring simultaneously, eliminating large trenches. Faster installation. 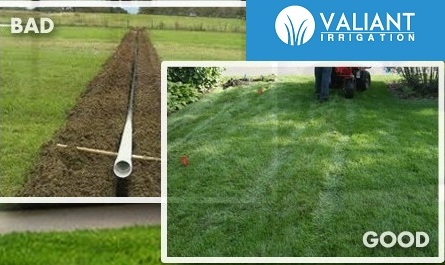 Because we dig the waterline and lay the pipe using underground boring methods, your lawn is virtually undisturbed. Sod can be stamped back into place or laid for the first time without any leveling. Reduced cost – no need to re-seed. As soon as your installation is complete, we simply stamp the soil and turf back into place, leaving almost no sign of our work. Less damage to your lawn. Trenchless irrigation eliminates the unsightly lines left behind with traditional irrigation installation. This method also allows your sod or grass to heal quickly. And because of our specialized equipment, we can install irrigation pipe and electrical conduit under sidewalks and driveways. For more information about our trenchless irrigation process, please call us at 270.227.2828.